Description Page 19: Copies of two black and white photographs. 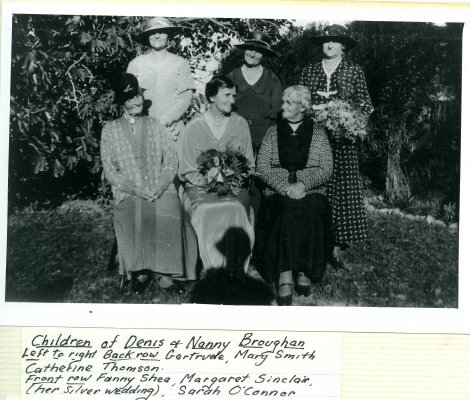 Top copy is of the children of Denis and Nanny Broughan, left to right back row: Gertrude, Mary (Smith), Catherine (Thomson). Front row, left to right: Fanny (Shea), Margaret (Sinclair), and Sarah (O'Connor). Bottom copy is a family group. 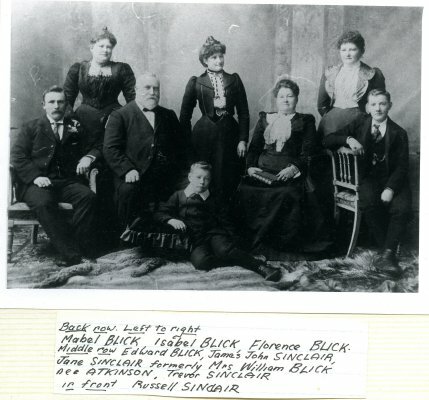 back row left to right: Mabil Blick, Isabel Blick, Florence Blick. Middle row left to right: Edward Blick, James John Sinclair, Jane Sinclair, formerly Mrs. William Blick, nee Atkinson, Trevor Sinclair, and in front, Russell Sinclair.